~The next two days’ posts will be a special installment from Mom, the OFS co-yarnie. 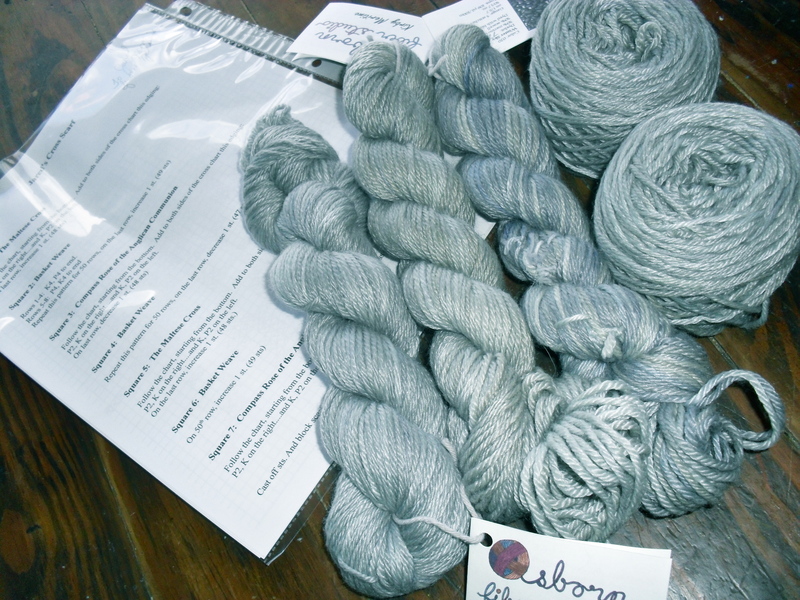 When you’re giving a Christmas gift to a knitter, it doesn’t have to be a completed project. It can be just a special yarn! And to make it even more special, it can include a pattern designed just for the knitter. Jared (my son-in-law who is a very good knitter) likes different kinds of crosses, and I got inspired a few weeks ago to make a scarf pattern just for him. I had 5 skeins left of a pretty steel blue from the Kirby Meritime yarn, and I thought it would look good on him. So I designed a pattern with four crosses in it: two designs, each knit twice. One is called the Maltese Cross or St. John’s cross. The other is called the Compass Rose of the Anglican Communion. Since Jared is studying to become an Anglican priest, I thought he would like that one especially. 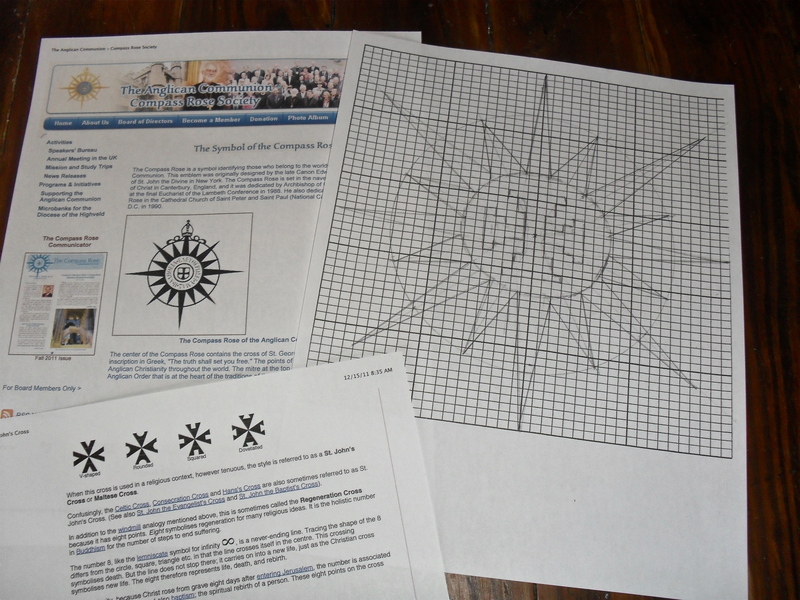 You can see to the right of the Compass Rose cross, some graph paper with an enlarged copy of the cross. 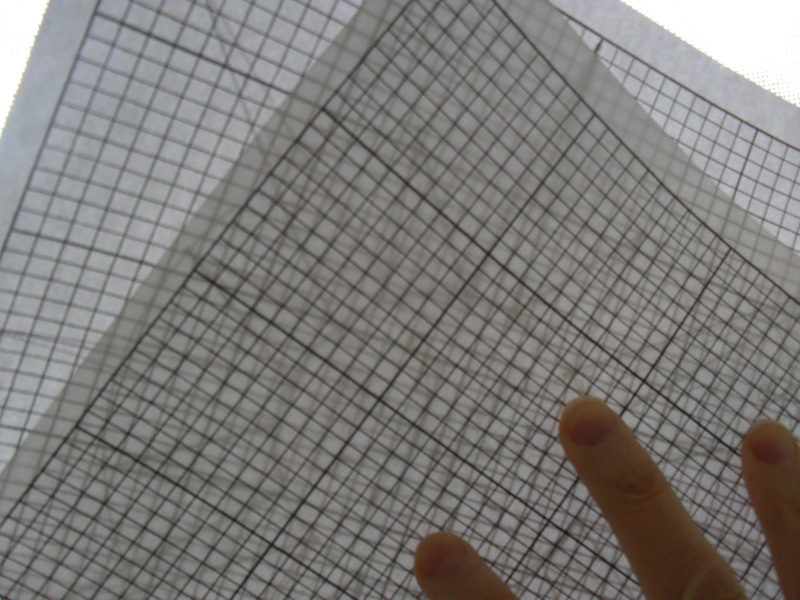 This graph paper is knitting graph paper, which knitters can use to make a chart for knitting. 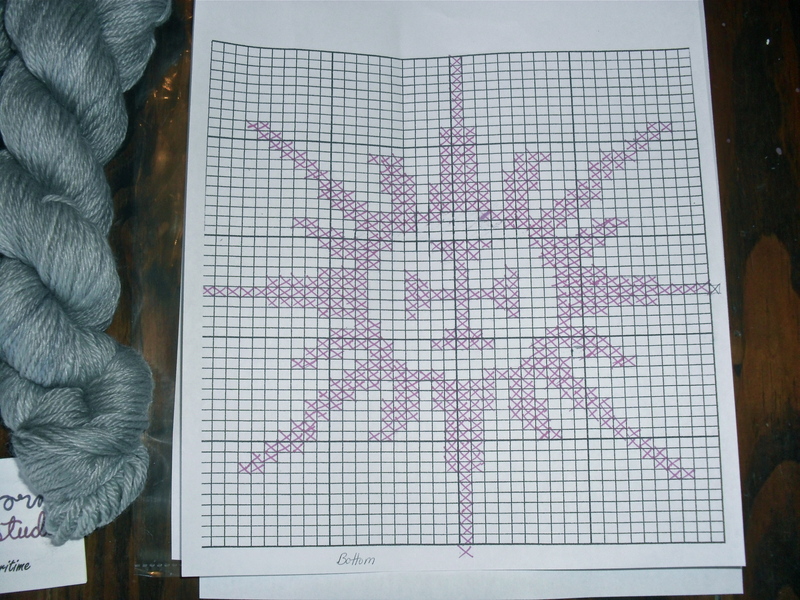 It is special in that each graph “square” is not perfectly square, because knit stitches are not the same height as width. “Squares” on knitting graph paper are actually rectangles similar in dimension to the knitted stitch, so anything I draw onto it will be reproduced into knitting in the same dimensions. I’ve made many designs this way, and it’s a fun way to design charts if you are impatient like I am with learning new computer software. 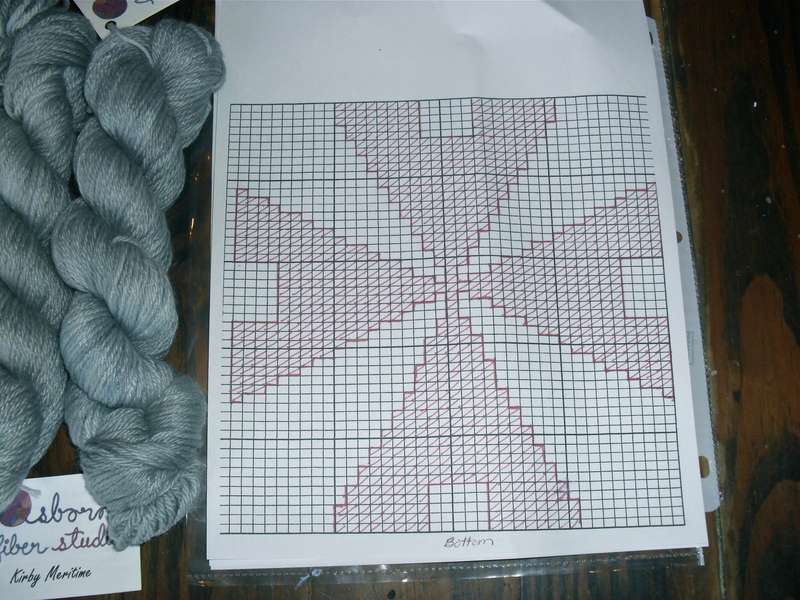 The actual scarf is made by knitting each of these cross charts twice, with basket weave stitch rows in between. He can decide how long to make the scarf, by choosing to make 50 rows of basket weave or 20 rows of basket weave. I hope Jared enjoys knitting the pattern, and enjoys the soft, pretty yarn that I dyed. It’s meant to by a fun pattern, not too stressful. I’ll be excited to see it knit up! I have been searching for a knitted sock pattern that has a christian cross on it. I wonder if I would be able to incorporate any of your crosses on it? I’m not too sure how to incorporate it though. I have been wanting to knit a black pair of socks with an open cross on the front foot part of the socks.